Fans wave their arms while Maleek Berry performed at the Tidal Stage during Made In America along the Benjamin Franklin Parkway on Sunday, September 3, 2017. Made in America is on the move, and the festival could be gone from the city for good. 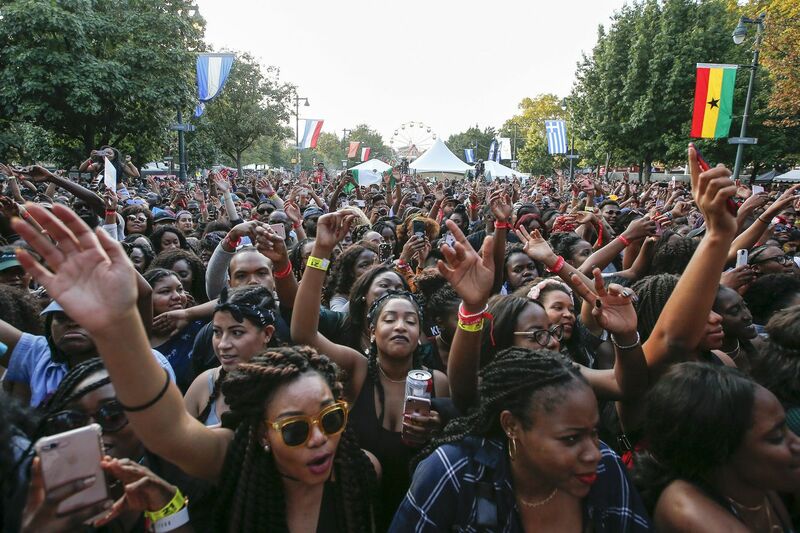 Since 2012, the ticketed Labor Day weekend gathering has taken place on the Benjamin Franklin Parkway, with Beyoncé, Rihanna, Kanye West, Pearl Jam, and Jay-Z among the big-name attractions. Beyoncé and Jay-Z are a happy couple on ‘Everything Is Love.’ Is that good for their music? This year, Nicki Minaj, Meek Mill, Post Malone, and Diplo will be among the hip-hop headliners to perform in front of the Philadelphia Museum of Art steps on Sept. 1 and 2. They will also likely be the last. On Tuesday, Mayor Kenney's office said Made in America will be held on the Parkway for the last time this year. That story was first reported by the news site Billy Penn. "This is the last year MIA will be held on the Parkway," Sarah Reyes, deputy communications director for the mayor's office, said in a statement to the Inquirer and Daily News on Tuesday. That doesn't necessarily mean that the festival, which has attracted as many as 50,000 people on each of its two days to the area around Eakins Oval, will not be in Philadelphia in 2019 and later. Over the years, the festival has drawn criticism and noise complaints from neighbors along the Parkway, while also transforming the cityscape into an open-air venue. And unlike fests in remote locales, Made in America, which will present scores of bands for a two-day pass of $175, is uniquely accessible, in the heart of a major city. If the festival were to move off the Parkway, that specific vibe, not to mention the aerial shots on the webcast of one of America's grand boulevards, would likely be lost. The city says the role of the festival has changed since its inception in 2012, when Made in America began under during the administration of Kenney's predecessor, Michael Nutter. The city's statement did not rule out moving the festival to another site in Philadelphia. "It's unclear how MIA will want to proceed in the future, but the city is interested in discussing alternate locations within Philadelphia for future years," it said. "We are interested in discussing the festival's future with the producers and look forward to continuing a partnership." The news was a surprise to Live Nation and Roc Nation, Al-Joulani said. "I woke up to read an article on Billy Penn that we're not welcome back to the Parkway after 2018," he said from Los Angeles. "I was surprised and disappointed after our very successful run. I had no indication, my partners and Roc Nation had no indication, no request for a face-to-face meeting. I had no idea. I was literally on my way to the office, and I had to pull over and read the story. I was shocked. They broke up with us in the press." From the beginning, Made in America has made the streets of Philadelphia a key part of its identity. Jay-Z announced the festival launch in 2012 on the steps of the Art Museum with the American flag hanging behind him. The New Yorker said the decision to locate the festival here was in part because of the egalitarian symbolism of having it in "such an iconic city," with a musical history "second only to Motown." "By saying that they're not going to accept us back on the Parkway, they are saying that Made in America as we know it is over," Al-Joulani said. The Live Nation exec said he was "still in the surprise phase" and hadn't yet considered what alternate Philadelphia sites could be considered. Could it move to Lincoln Financial Field, with Labor Day weekend so close to the annual start of the Eagles season? Would it make sense in Camden, where the BB&T Pavilion and adjacent Wiggins Park are the site of the annual Xponential Music Festival? But then it would be a New Jersey festival, rather than one in the city where America was made. Despite being taken aback by the city's announcement, Al-Joulani said he believes that renewed discussions could leave to MIA returning to the site that has always been its home. "I'm absolutely hopeful," he said, "that we can figure out a way to open up a dialogue with the city so we can be back on the Parkway in 2019." Until this year, MIA was known as Budweiser Made in America. The beer giant owned by Belgium-based Anheuser Busch InBev branded its red, white, and blue colors with the festival name and made sure that Bud was the only beer that could be purchased within the fest's gated grounds. Budweiser dropped Made in America this year, however. Last month, a Bud executive told Advertising Age that the beer company, which spent more than $1.5 billion on music marketing last year, was focusing its music tie-in efforts more on country music, where presumably more of its drinkers are, than the hip-hop and R&B fans that MIA attracts. This year's fest plans to offer more variety in food and drink options, and has a number of new corporate sponsors, including Puma, Abercrombie & Fitch, and American Airlines.